I'll start with the basics: My name is Joe Fairchild, I'm 27 years old and originally from Saginaw, MI. I graduated from the University of Michigan in 2006 and currently live in Chicago. It was in college that I really started running, motivated in part by my younger brother Brent running track in high school, and in part to offset the freshman 15. In late May I was on the phone with my brother discussing marathon training plans and goals. The conversation was long overdue--after qualifying for the Boston Marathon by running a 3:12:54 in Cincinnati last May, I had let myself go and posted 4:39:39 in Chicago in October, a difference of nearly an hour and a half... and 25 pounds. During the call, Brent mentioned the idea of running across the country to raise money for charity. Over the next few days I thought about the idea constantly as it transitioned from crazy to feasible, from something I wanted to do with my brother to something I knew I had to do alone. Mens sana in corpore sano is a Latin phrase which means "a sound mind in a sound body" and sums up my motivation for attempting this run. The 3,400 mile run will take about 4-5 months. 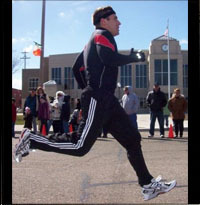 Completing it will be quite a physical feat, and averaging 25+ miles per day will really stretch my body to the limits. But for me, the largest component of the run is the mental aspect. My intention is for this run to be a spiritual journey. The time I spend alone running will allow me to meditate and reflect and really discover the limits of my mind and body. Continue reading about The Plan or return to the Home Page. Me running. I almost look like I know what I'm doing.